Ask for Help - we're itching to show you the best flight deal! Using the flight price comparison tool (on the left) to search, contrast & book the cheapest flight deal from Cape Town to London. Using SouthAfrica.TO discount vouchers to further reduce the cost of your flight. If you've got no vouchers, then start earning them with your British Airways flight - simply email us a writeup of your flight and we'll send you discount vouchers (our readers are our writers). 2016-03-30 As the only airline still operating direct flights between Cape Town and London, we are rejoiced to announce that British Airways will be introducing seasonal direct flights between Cape Town and London Gatwick airport. Although slightly out of the way, London Gatwick is a great airport for South Africans visiting family in the area and could be a more affordable alternative during peak traffic periods. They will start operating this route in November 2016 with three weekly flights (Mondays, Thursdays and Saturdays). They will make use of one of their 12 Boeing 777's at Gatwick airport to operate the route. 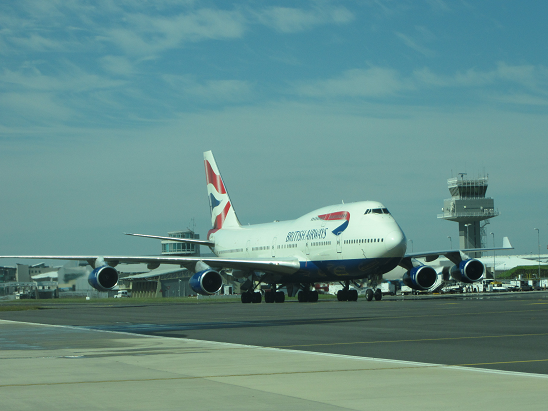 2015-09-30 British Airways is cutting back on it's Cape Town-London flights. From the 27th of March 2016 they will reduce their 9 flights per week to 7 flights per week, making it a simple daily service. Flight BA045 LHR-CPT has been cancelled on Thursdays and Saturdays, while the return flight BA044 has been cancelled on Fridays and Sundays. They will resume a daily service on this route during the South African summer. BA have denied that South Africa's stringent visa regulations has anything to do with it and stated that they will increase flights on the route during the South African summer. 2014-09-15 British Airways announced that they will be increasing flights between London and Cape Town to 14 a week from 29 March until 27 April 2015. Thereafter they will revert to 9 flights per week. 2013-09-11 British Airways plans on refurbishing its lounge at CPT in the style of its lounges at LHR and reopening it in late 2013. There'll be a temporary spot where one can pick up snacks & drinks. Flight BA0058 is scheduled to leave Cape Town at 20h45 and arrive at London Heathrow at 06h30. Flight BA0042 is scheduled to leave Cape Town at 22h10 and arrive at London Heathrow at 07h50. 2013-06-18 Rating 3/5 : I have just had my first experience of British Airways World Traveller Plus flying overnight direct from Cape Town to London. I've flown this route multiple times and on many different airlines and have come to the conclusion that whilst the indirect flights might be slightly less expensive, it makes the journey so long as to become an ordeal. British Airways and Virgin Atlantic are the only airlines to fly direct from Cape Town to London. British Airways online check-in opens 24 hours before departure. I remembered to log into my BA account ten minutes after it opened only to find that the flight was so fully booked that no seat changes were possible and that, horror of horrors, I had the middle seat. I HATE the middle seat, sandwiched between two unknowns and forced to climb over people to go to the loo. But the online system worked efficiently and all I needed to do was print off my boarding pass (there was even an old school option to have it faxed to you!) and pitch up at the airport a couple of hours ahead of time. At the airport there was a double security system where a security firm checked passports and flight documentation before passengers go to the airline desk where they check again. It all seemed a bit pointless. The queues for economy and World Traveller Plus were lengthy yet the airline desks beyond didn't have anybody there. I think I must have been living in South Africa too long, I've lost my innate British ability to queue and went straight through the first class section to the bag drop. It all started off so well, the joy of turning left in the plane. Although I had the dreaded middle seat I was right at the front where they usually put mothers with small babies so I had a little extra space which was extremely welcome. And, joy of joys, the seat was adjustable so you could recline it (not just the normal gesture inch) and had somewhere to put your feet. The cabin staff were scrupulously polite and helpful. Newspapers and hot towels were handed out before take-off and they seemed to have fewer passengers to look after than the usual harassed looking crew in economy. 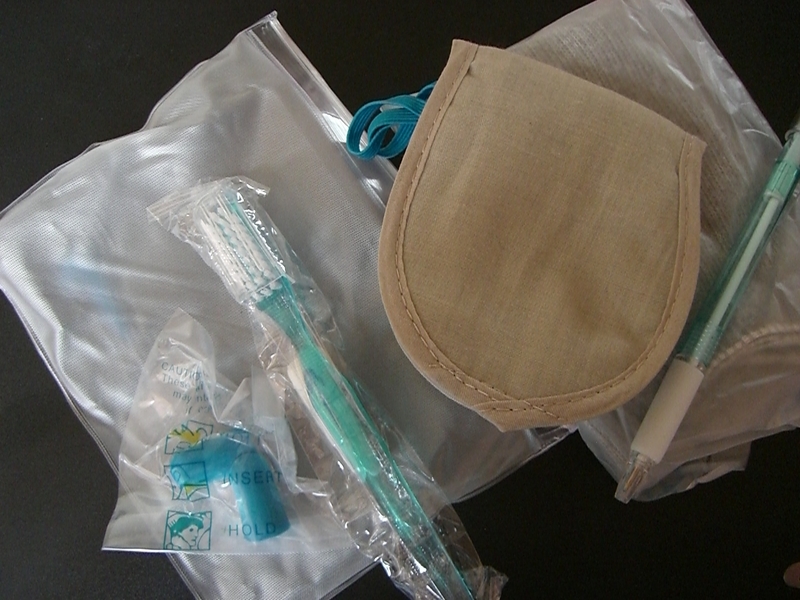 Little goodie bags were given to each passenger containing flight socks, an eye patch (useful if your neighbour wants to read through the night), a random pen, earplugs and a toothbrush and paste. I managed to instantly break the flimsy plastic pochette it all came in and eye patch aside, it seemed a bit of a waste. My seat had a touch screen TV that popped out of the arm of my chair. Initially I struggled with the sound (there wasn't any!) but the air steward quickly rectified that by bringing me some new headphones. It was a real treat to have so many films on offer, a current selection as well as some classics and I enjoyed watching Great Expectations with Helen Bonham Carter as the unenviable Miss Havisham. Dinner was interesting. 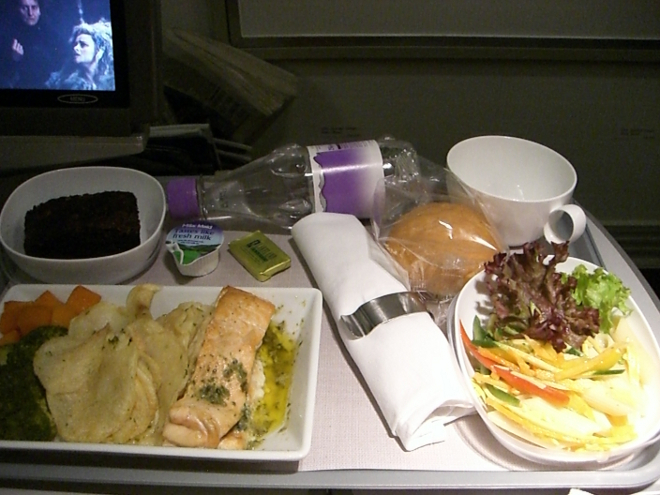 Shortly after take-off we were given beautifully printed menus telling us what 'authentic, balanced choices, from the source' we were going to be served. Except that wasn't actually what was on offer. I had trout as the main course but the 'three bean salad' looked distinctly like penne pasta to me and the pudding was totally unidentifiable but I'd put money on it being anything other than apricot flan. Sadly the paper quality of the menu was not indicative of the food; very dry fish sitting in oily butter, flaccid slices of potato and vegetables which would have been overcooked in half the time. My secret weapon for flying is a hot water bottle. 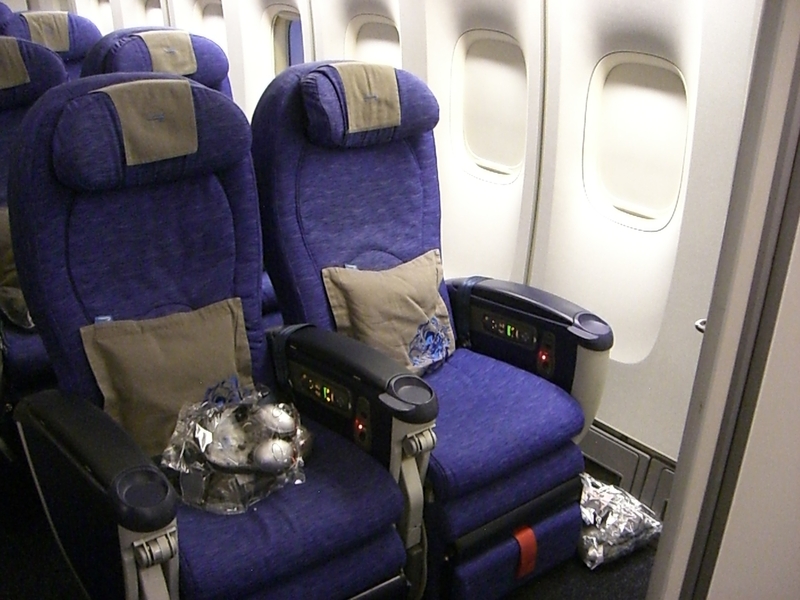 It may sound rather eccentric but on those night flights it really adds a world of comfort. I also always bring a mohair blanket with me, it's light and super warm – even in World Traveller Plus there's only one prison style blanket so small you have to pick which half of your body to keep warm. I slept surprisingly well. I was marginally disappointed with World Traveller Plus but I think the problem was a question of expectations. I was under the impression that it would be somewhere between economy and business class, more frills and space than the average cattle class seat. World Traveller Plus is definitely a step up from economy; you do get fractionally more space and the adjustable seat is a bonus but I'm not sure it justifies the price tag. I'd put it at three (if one is terrible and five is fabulous); not painful but nothing to write home about.